After Ntel stopped the 12GB Data for 1000 Naira wawu plan, it was like a close door from Ntel to many customers because the new data plan seems expensive. 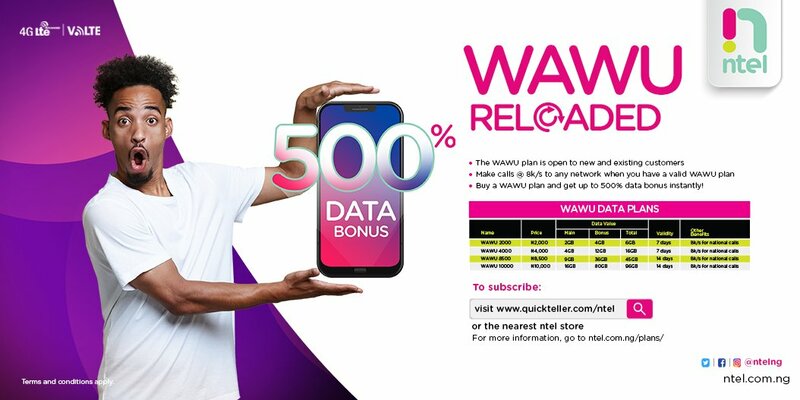 Ntel recently launched another wawu data plan offer called wawu reloaded which gives 500% data bonus. The new Ntel wawu 500% data plan reloaded are not what they seems to be as Ntel cleared our doubt with their latest updates on their twitter handle. Except if you are subscribing for unlimited monthly plan of N17500 to last you for 30 days, or unlimited night classic of N5000 with 30 days validity, every other plans is not recommendable. Wawu 12GB for N1000 is gone for life and it will take a miracle for it to come back. Ntel recently posted on their social handle the update of the new plan and how you can recharge it. kindly let us know if the wawu plan still works for you or the 500% bonus they are making reference to is different from the above.